Barcelona Open Semifinals: What time does Rafael Nadal play against Philipp Kohlschreiber? 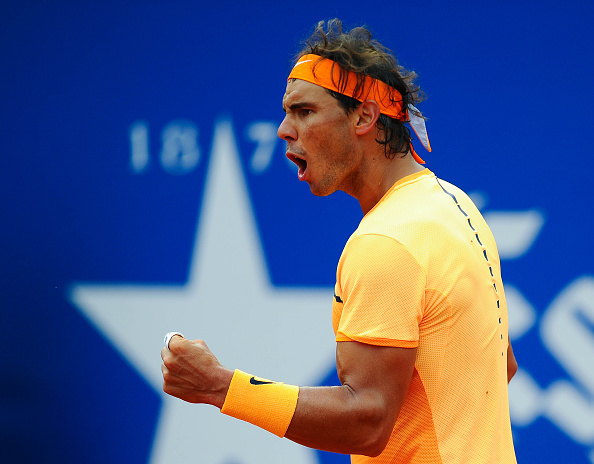 On Saturday, Rafael Nadal will play his semi-final match at the Barcelona Open against Philipp Kohlschreiber, who defeated Andrey Kuznetsov 6-3, 6-1. Match time: 4 PM local time / 10 AM EDT – New York, Montreal / 3 PM BST – United Kingdom / 4 PM CET – Spain, France, Germany, Italy / midnight – Melbourne. To convert to your local time, use this website. Kohlschreiber is 15-7 for the year following wins this week over Pablo Carreno Busta, Feliciano Lopez and Andrey Kuznetsov. The German won just one match against our champ in 12 meetings and that victory came four years ago in Halle, but at that time Rafa wasn’t in good physical conditions. On clay, Kohlschreiber is 0-3 against Rafa. Good luck RAFA, …………..CHOMP, CHOMP. As you said and always say the past is in the past. You are focused on what’s in front of you right this moment, Kholi. When you are done with him then Kei. I’m so happy to see that fire in your eyes, we missed it for a while. This is a new Nadal we are watching. very different tactics from years ago, built on vast experience and the ‘new’ tennis. All the very best from all of us. Great to see Rafa coming up after so long,but remember hes not playing some of the best apart from Murray of late. I WISH HIM ALL THE BEST FOR THE SEASON BECAUSE HE IS THE BEST PLAYER OF THE CURRENT ERA.HES JUST HAD A LONG RUN OF BAD LUCK..AND LUCK DOES PLAY A PART IN TENNIS. All the best Rafa!! U will do it!! Vamos Rafa, tu puedes y lo has demostrado. Con todo Champ!! Please explain to Mr. Low Confidence that his demise has arrived and that the King of Confidence has replaced him. Mr. Low Confidence will understand that he can’t win, not with all the fans, family and friends who adore the King of Clay. Not nice to try to steal Kohlschreiber’s thunder . I am worried that Nadal is going to exhaust himself. Again he has been playing every tournament. According to his schedule, he has only about 13 days of rest remaining from now to RG. He has to finish Barcelona, then there is Madrid, and then Rome; all Masters. Will he have enough steam for RG. I want him well rested, focused and full of confidence. I agree. He lost to Kohlschreiber fair and square in Halle. Just like the loss to D. Brown in 2014, Rafa was never at his best there. Good luck for tomorrow! Vamos Rafa!! !